The iPad continues to be a great work machine. Anyone who tells you otherwise either hasn’t put in the effort, or is just blowing smoke. It’s fundamentally different to a regular computer, the way a computer is different to a typewriter, or using public transport is different to using your own car, and I think most of the “I can’t get work done on an iPad” nonsense just comes from people who try to do the exact same thing they do with their computers, only with an iPad. The iPad continues to be a great work machine. Anyone who tells you otherwise either hasn’t put in the effort, or is just blowing smoke. To continue the transport analogy: If you try to treat public transport like a car, you’ll complain that you can’t drag a trunkful of crap to visit your mother, or shop at the local megamart once a month. Or that you can’t go where you want, when you want. But stick with it for a while and you’ll see that you get to know the bus and metro schedules. That you can hop on your bike and buy groceries for a couple days at the local stores. You’ll enjoy being able to have another beer one night, or reading on your commute instead of screaming at those other idiot drivers in a traffic jam for an hour each morning. Plus, you’ll save enough in running costs and parking to take a taxi whenever you like, and still save money. It’s all about shifting your state of mind. Yet despite all of this, I had to give up on using the iPad for everything. You see, I developed “Gorilla Arm,” the affliction which many writers cite as a reason we won’t see a touch-screen Mac anytime soon, and yet which few, I suspect, have experienced. Gorilla Arm is pain in the upper bicep, just below the shoulder, coupled with pain in the chest muscle where it joins the shoulder. Gorilla Arm is, in my case, a tightness and pain in the upper bicep, just below the shoulder, coupled with pain in the chest muscle that joins the shoulder. It’s caused by using the iPad in “laptop mode,” propped up behind an external keyboard. Typing is fine, but every time you want to do anything – selecting text  ; switching apps, tapping an on-screen button – you need to hold your arm out in front of you to do it. And the stronger and more muscular you are, the harder it is. Try doing this day after day for over a year and the result is very painful, to the extent that I would sometimes rush through posts just to get them finished. It gives great demo, but after a short period of time you start to fatigue, and after an extended period of time, your arm wants to fall off. So I went out and bought a MacBook Air. I grabbed the 128GB 13-inch with 4GB RAM, as this will only be used as a writing machine. Why not the 11-inch? Because if I still need a portable setup I’ll take the iPad and a keyboard – I figure once my shoulder has fixed itself I’ll be good for the occasional spurt of work with the iPad – and because the battery life on the 13 is so much better. Also: big screen. I won’t be ditching the iPad altogether. 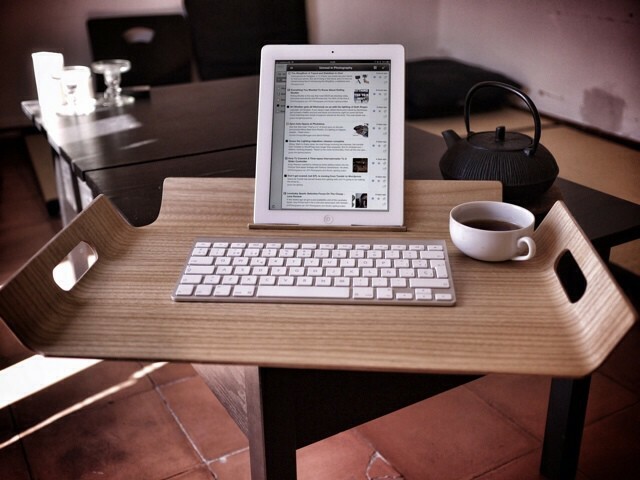 In fact, the Mac will be used for writing. The eagle-eyed amongst you will have noticed that most of these are just iOS clients for web services. Mailbox is a fancy way to use Gmail and to organise incoming messages and send the keepers to Omnifocus (I use IFTTT for this). Omnifocus itself syncs between platforms, but my favorite is the iPad app. Mr. Reader is my RSS client, and it’s tricked out to send things to the Pinboard bookmarking service, or to Readability, or Omnifocus. Pinbook is for bookmarking (web-based, again), and even Snapseed is connected to the cloud via Photo Stream. I’m about to contradict my earlier point about letting go and learning a new way to do things. The fact is, I have used the Mac for years, and I’m pretty sure the iPad does some things better. So part of my plan is to bring some aspects of the iPad-only “workflow” back to the Mac. Specifically, that means using apps which work together. It also means relying heavily on iCloud and Dropbox. On the iPad, I used Writing Kit to write posts in Markdown, and then I’d export them to blogging app Poster to add pictures and dress the post ready for publication. The key parts of this for me were that I had different apps which each did one thing well, and I could daisy-chain together. Most important was that I never had to visit the abortion that is WordPress’ web-editing suite. Full-screen. Typewriter mode. Dark linen… What’s not to like about this? 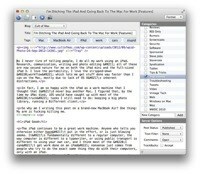 MultiMarkdown Composer doesn’t offer the neat integration with a built-in browser that Writing Kit does (it can insert images and links from the current web page right into your text), but it doesn’t need to: the Mac has plenty of ways to do this, from System Services, to bookmarklets, to Applescripts and so on. Right now I’m using a service which pulls in the current tabs from Safari and turns them into Markdown reference links. 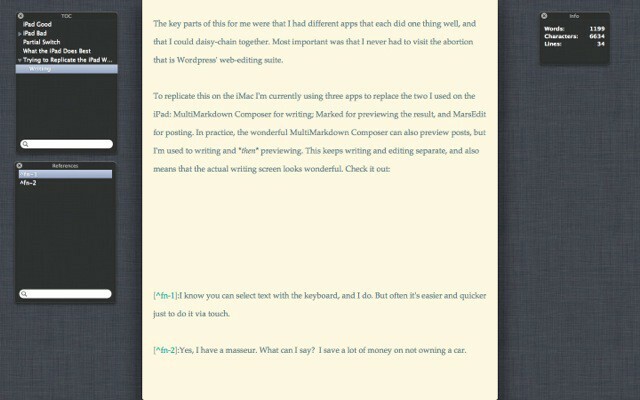 Once I’m done with a post, I hit ⇧+⌘+C to copy the converted HTML to the clipboard, then head over to MarsEdit. If MarsEdit works out, I’ll probably come up with a way to automate this step. MarsEdit really comes into its own on a portable, small-screen Mac. Why MarsEdit? Because it lets me add all the pictures, tags and metadata to a post before sending it up to WordPress. It also plays nice with several of our plugins, meaning fewer trips to the WordPress backend in the browser. It also integrates with Brett Terpstra’s excellent Marked app for previews. But another big reason is pictures. Like Poster on the iPad, I can drop any picture I like into MarsEdit and it will resize it automatically to 640 pixels (it won’t convert PNGs to JPGs like Poster, though) and upload it. Better still, it uses the OS X media browser, so I can grab pictures straight out of my Photo Stream and insert them into a post. Why is this important? There are a bunch of ways to get pictures from the iPad to the Mac. One of the best is PhotoSync, and I use it almost daily (it’s also my favorite way to send full-res photos from my iPhone to my iPad). But even easier (when it’s actually working) is Apple’s own Photo Stream. Google cancelled Snapseed for the Mac, but it still lives on in iOS. Using Photo Stream I can take a product photo (for a review, say) on my iPhone and it appears almost instantly on my iPad. Then I can edit the picture in Snapseed and just save it to the iPad’s camera roll, from where it too is sent up to Apple’s giant photo cloud. Moments later it’s there on my MacBook, safely inside iPhoto (I’m running iPhoto solely as a Photo Stream app on this Mac – 128GB of storage is too small for anything else). And if it’s in iPhoto, it’s available to any app using the oft-forgotten Media Browser (it’s there in every Finder open/save dialog) – including MarsEdit. Thus, things are kept tidy, without multiple copies of images cluttering the place up. This is the beginning of a new way of doing things, so I’ll be tweaking things a lot until they become as efficient as they were on the iPad. But I’m fully intending to use all the Mac has to offer that the iPad still doesn’t: a proper clipboard history, for instance. Or system services which glue things together. Keyboard shortcuts for everything. This MacBook Air is a writing machine only, and I shall be fine-tuning it over the coming weeks. One of the advantages of writing multiple posts and thousands of words a day is that you quickly learn what works. Give me a couple of weeks and I’ll make another post about how things are going. I already have an idea about using Core Image filters to make an Image Capture plugin which auto-edits photos on import, readying them for publication. We’ll see. In the meantime, I have just rattled off around 1,800 words, and my shoulder feels great.